Bruce Lee has noticed more than a few changes after more than 20 years spent selling sporting goods in Steamboat Springs. Inside the walls of Straighline Outdoor Sports, he says customers will find the most important thing they need if they plan to hunt in Northwest Colorado. In fact, Steamboat Springs and Craig have several businesses offering hunters a place to find those forgotten items, or to fill their hunting wish list. The list of stores ranges from family-owned business like Straightline to the larger outlets like Wal-Mart and Cashway Distributors. In Craig, Cashway Distributors owner Jim Simos says his store offers an experienced staff, and a large selection. Cashway opened its door to hunters in 1962, and Simos bought the business in 1992. The 8,500 square foot store carried more than $800,000 in inventory last year to meet hunter’s needs. While Internet retailers like Cabela’s have changed the way many hunters go about preparing for the season, these storeowners feel like their knowledge and experience gives the retailers in Northwest Colorado an edge. Simos said there are always new items every hunting season, but the basic needs stay the same. Hunters are normally looking for the clothing they need to be comfortable in whatever season they’re hunting and they want reliable equipment they can count on. But in Craig the one thing that brings most hunters through the doors, Simos says, are hunting licenses. 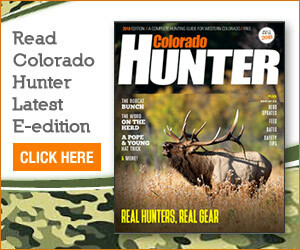 “We’ve been number one in hunting license sales for the last three years,” Simos said. Bruce, and his brother, Brett Lee, continue to dedicate a significant part of their store to hunters and their needs, but admit that the sale of skiing and camping equipment drives their business. Bruce Lee says he doesn’t have the space to compete with the Internet, catalogues or large stores like Cabela’s, but hunters can still find most of their need inside his store, and a few things they will not find in those other places. Straightline has built a reputation among hunters in Northwest Colorado built on solid advice and quality equipment. The store sells licenses, maps, and game calls and other basic hunting gear. It’s also a great place to find quality camping and fishing gear. The store also carries a wide range of gifts that many hunters might want to take home to family members when they are done hunting. Bruce Lee says Straightline's involvement with hunting comes from a love of the sport that is a big part of his family, and the family-run business.Bruce Lee says Straightline's involvement with hunting comes from a love of the sport that is a big part of his family, and the family-run business. Hunters can also fill their hunting needs in Steamboat Springs at Wal-Mart and the Sports Authority. James Redmond, depart manager at Wal-Mart, said his store already has some hunting and camping gear, but will start stocking up for the season in August.Hunters can also fill their hunting needs in Steamboat Springs at Wal-Mart and the Sports Authority. James Redmond, depart manager at Wal-Mart, said his store already has some hunting and camping gear, but will start stocking up for the season in August. Bruce Lee says Straightline’s involvement with hunting comes from a love of the sport that is a big part of his family, and the family-run business. Hunters can also fill their hunting needs in Steamboat Springs at Wal-Mart and the Sports Authority. James Redmond, depart manager at Wal-Mart, said his store already has some hunting and camping gear, but will start stocking up for the season in August. The store also offers licenses and plenty of camouflage.